This week we feature an article published by Stenberg et al in Trends in Plant Science that describes the potential benefits of optimizing crops for biocontrol of pests. It is difficult to estimate the true costs of herbivore damage to crop plants, but it is clearly in the billions of dollars; much more when pesticide costs are included. Any decrease in herbivore-induced damage can be tremendously beneficial. Herbivores and plants have been co-evolving for millions of years. Fossils and phylogenies allow us to reconstruct the history of the escalating plant-herbivore arms race. As plants acquire new defenses, disabling mechanisms by herbivores inevitably follow. The plant defense arsenal includes physical defenses (e.g., thorns, trichomes, and silica), and a huge array of chemical defenses (e.g., cocaine, nicotine, and caffeine). Plants attract and retain carnivores through two basic strategies: food rewards (Heil, 2015) and the release of information-rich volatile organic compounds (VOCs) (Heil, 2014; Unsicker et al, 2009; Bruce and Pickett, 2011). Food rewards can include pollen, sap, and nectar. Nectar, although commonly associated with flowers and pollinator rewards, also can be secreted from vegetative tissues as extrafloral nectar. 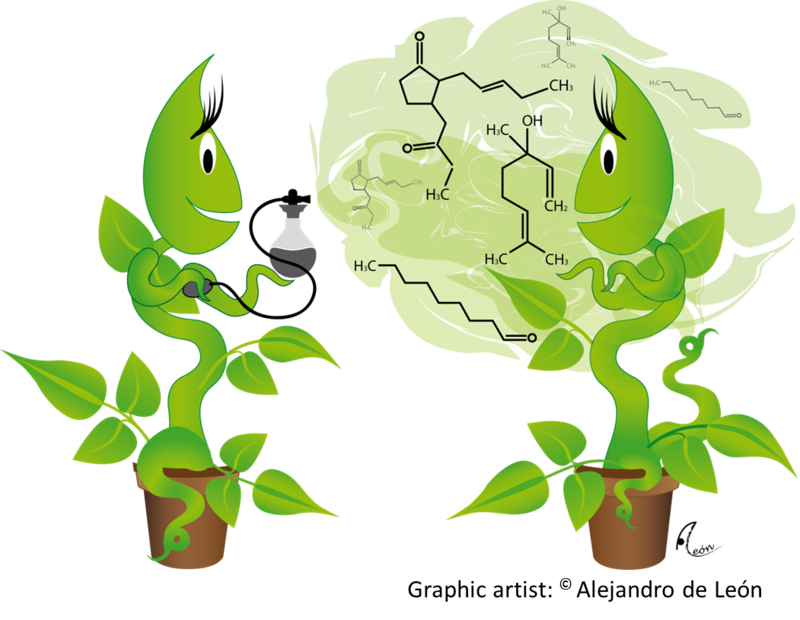 Plant volatiles are metabolites released into the air or soil, where their mobility makes them effec tive signals. Volatile compounds have many functions, including protecting plants from abiotic stress, attracting pollinators, predators and parasitoids, and deterring herbivores (see Baldwin 2010 for an excellent overview). Note that by attracting friends or repelling enemies, volatiles emitted by one plant can also benefit plants nearby. In their Opinion article, Stenberg et al summarize a great deal of evidence that 1) traits involved in indirect defense such as VOC production and food rewards can be effective at deterring herbivory, 2) VOCs can also have direct roles in defense such as by priming plants to respond, and 3) these defensive traits often have been lost during domestication (see for example Tamiru et al., 2015). The thrust of the article is that plant volatiles and food rewards are underexploited approaches to crop protection. First, the authors provide examples of successful strategies. As one example, they describe a “trap and reward” system in which crop plants are planted alongside mechanical dispensers that emit synthetic chemicals to attract carnivores, and “reward plants” that provide the carnivores with extrafloral nectar (Simpson et al, 2011). 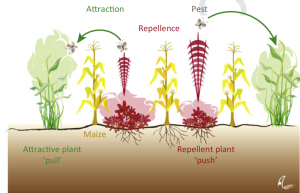 Another example that effectively exploits volatiles through co-cropping is the push-pull system that uses both repellent and attractant companion plants to push and pull herbivores away from the crop (Khan et al, 2014). The authors also describe an ongoing project, Salix Molecular Breeding Actions (SAMBA) in which plant breeders and insect ecologists worked together to identify willow traits that attract natural enemies of detrimental beetles. Through this collaboration they identified an omnivorous insect that is an effective biocontrol agent (Ågren et al 2012, Lehrman et al., 2013). 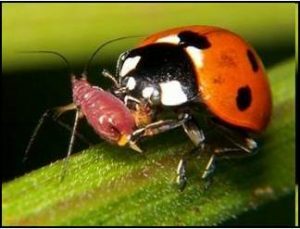 There are many challenges to the biocontrol approach, but the authors also provide specific recommendations for success. Challenges include the fact that VOCs and extrafloral nectar production are multigenic traits that are not trivial to breed or select for. Furthermore, metabolic cost associated with introduced indirect defenses are important considerations that may impact yields but are difficult to calculate. Insects learn, so efforts to game the system for example by signaling a reward but not providing it are likely to be unsuccessful (Stenberg et al., 2015). Finally, laboratory successes don’t always translate well to more complex field conditions (Bruce et al., 2015). Clearly, some situations will be more amenable to biocontrol approaches than others. For example, tritrophic defenses may work best in perennial or forest systems that provide carnivores time to accumulate, or in closed system such as greenhouses where carnivores can be introduced and confined. Furthermore, inducible signals may be more effective than constitutive signals (Stenberg et al., 2015). In spite of minor limitations and setbacks, this exciting intersection of ecology, physiology and agronomy is sure to yield new strategies for crop improvement. 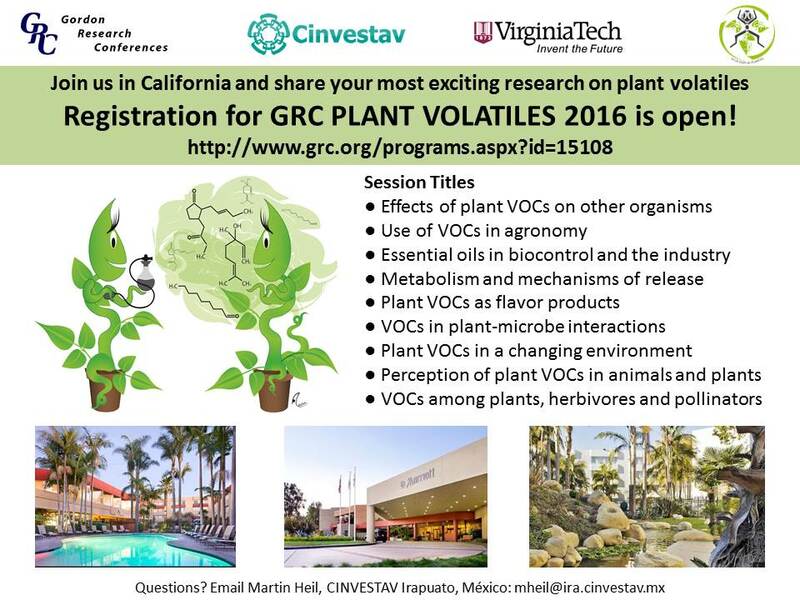 For those interested in learning more a Gordon Research Conference on Plant Volatiles, “Diversity of Targets, Effects and Applications of Plant Volatiles” will be held in Ventura California beginning January 31, 2016. Ågren, G,I,, Stenberg, J.A. and Björkman, C. (2012). Omnivores as plant bodyguards – A model of the importance of plant quality. Basic Appl. Ecol. 13: 441-448. Baldwin, I.T. (2010). Plant volatiles. Curr. Biol. 20: R392-R397. Bruce, T.J.A. and Pickett, J.A. (2011). Perception of plant volatile blends by herbivorous insects –finding the right mix. Phytochemistry 72: 1605–1611. Heil, M. (2014). Herbivore-induced plant volatiles: targets, perception and unanswered questions. New Phytol. 204: 297-306. Heil, M. (2015). Extrafloral nectar at the plant–insect interface: a spotlight on chemical ecology, phenotypic plasticity, and food webs. Annu. Rev. Entomol. 60: 213–232. Khan, Z.R., Midega, C.A.O., Pittchar, J.O., Murage, A.W., Birkett, M.A., Bruce, T.J.A. and Pickett, J.A. (2014). Achieving food security for one million sub-Saharan African poor through push–pull innovation by 2020. Phil. Trans. Roy Soc. B. 369: 20120284. Lehrman, A., Boddum, T., Stenberg, J.A., Orians, C.M. and Björkman, C. (2013). Constitutive and herbivore-induced systemic volatiles differentially attract an omnivorous biocontrol agent to contrasting Salix clones. AoB Plants. 5: plt005. Simpson, M., Gurr, G.M., Simmons, A.T., Wratten, S.D., James, D.G., Leeson, G., Nicol, H.I. and Orre, G.U.S. (2011). Field evaluation of the ‘attract and reward’ biological control approach in vineyards. Ann. Appl. Biol. 159: 69-78. Stenberg, J.A., Heil, M., Åhman, I. and Björkman, C. Optimizing crops for biocontrol of pests and disease. Trends Plant Sci. (in press). Tamiru, A., Khan, Z.R. and Bruce, T.J.A. (2015). New directions for improving crop resistance to insects by breeding for egg induced defence. Curr. Opin. Insect Sci. 9: 51-55. Unsicker, S.B., Kunert, G. and Gershenzon, J. (2009). Protective perfumes: the role of vegetative volatiles in plant defense against herbivores. Curr. Opin. Plant Biol. 12: 479-485. Did I like The Martian? Yes!